HomeNew CarsNewsMaruti Ignis Variants Explained: Which One To Buy- Sigma, Delta, Zeta, or Alpha? Maruti Ignis Variants Explained: Which One To Buy- Sigma, Delta, Zeta, or Alpha? In all, there are 13 combinations in which the Ignis can be bought, however, for the sake of simplicity, let’s look at the four core variants: Sigma, Delta, Zeta and Alpha. The key features in the base Sigma variant are body coloured door handles, AC with heater, front power window with auto down on driver side, 12V accessory socket, tilt steering adjust, headlamp on reminder, dual front airbags, ABS with EBD and ISOFIX. The Ignis is aimed at millennials but the Sigma is a barebones variant and hence may not appeal much to its target audience. It doesn’t have the fancy LED projector headlamps with DRLs (which btw are offered only in the top-end Alpha variant). There are no alloys (only steel wheels without covers) or even an audio system. But with basic safety kit like ABS and dual front airbags, it is still a car you can consider over any other that doesn’t get these at this price. If you do opt for this variant, you’ll have to spend extra to spruce it up with additional features. The Delta variant gets wheel covers (still no alloys), turn signal on ORVM (outside rear view mirror), dual-tone dashboard, tachometer, audio with CD and FM, Bluetooth, USB and 2 speakers, steering-mounted control and audio remote control, remote keyless entry, electrically adjustable ORVM, day/night IRVM (inside rearview mirror), rear height adjustable restraint, rear seat 60:40 split, rear power windows and security alarm. The Delta variant is the one that offers value for money. For an additional Rs 61,000 (over Ignis Sigma petrol-manual) you get all the aforementioned features which make it seem a lot like a car with contemporary features and takes proper. The features on this variant will certainly make your life a lot more convenient in the long run. Some might find the AMT variant priced a bit steep as you pay Rs 55,000 extra for just the transmission but considering the convenience that comes along, the incremental cost will be worth for many buyers. The Ignis diesel starts with the Delta variant and seems like a decent choice for owners running their cars for more than 1000 km in a month. 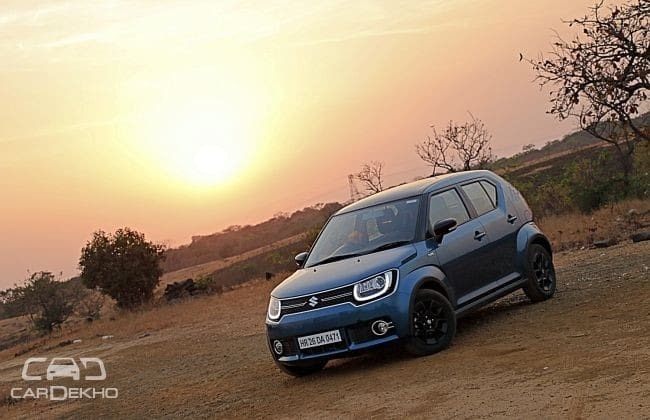 By giving the diesel engine a miss in the Sigma variant, Maruti Suzuki has probably ensured you won’t get to see an Ignis in yellow number plates on the road. The Zeta variant gets premium bits inside out. Such as chrome accents on the front grille and around the fog lamps, blacked out 15-inch alloys(finally), side moulding, 4 speakers with 2 tweeters, push start, electronic folding ORVM, Rear defogger with wiper and rear parking sensors. For those who have the moolah and really want to capture the essence of the Ignis and make a statement, then it is the next variant which you should go for. Let’s see what it gets. Goodies on offer above the Zeta variant here are the LED Projector headlamps with DRLs, puddle lamp, 7-inch Infotainment touchscreen with Apple CarPlay and Android Auto, Suzuki SLDA remote app, auto climate control(cockpit-style), driver seat height adjuster and a rear parking camera. The top of the line variant is certainly pricey but comes with all the bells and whistles. These features add a lot of bling, premiumness and the novelty value. We, however, wish Maruti Suzuki had offered the height adjustable driver’s seat in lower variants as well as that’s a feature that a lot of buyers would want in the value for money variants. So who should go for the Ignis Alpha variant? Well, the Ignis Alpha is expensive but it is also desirable. If you’re buying the Ignis to make a statement and have the budget to get the Alpha, go for it. Those who either don't have the budget or would settle for variants that deliver better bang for your buck can go for either the Delta or the Zeta depending on the budget.